So, it’s the twenty-first day of the twelfth month of the twelfth year of the new millennium, and the World has not even begun to end yet……what do you do? You check out some of my favourite Apocalypse themed videos, of course! Third, how about a Robopocalypse? Actually, it’s more like “Yesterday on the Internet” because I was planning on writing this post yesterday. But didn’t. Anyway….. I wanted to share some links with all of you guys. 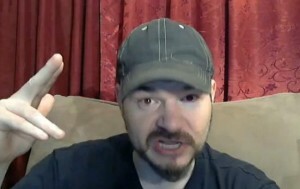 Dusty Smith of the "Cult of Dusty"
First up is this very emotional video by Dusty Smith, Atheism and Suicide, where he talks about a very recent tragedy. He reminds us all that life is amazing and worth living. We are all important to someone. And we shouldn’t wait too long to tell the people in our lives how important they are to us. All of a sudden it might be too late. Don’t wait until someone is dead to say nice things about them. Tell them while they are still alive to read or hear it! I think a lot of us are guilty of waiting too long, and I will certainly try to change that for myself. I hope that by sharing the video, I can help spread Dusty’s message to others, as well. Dicken feat. Milah & Korben: "Everything Counts"
I’m a very emotional guy and the video made me really sad. Luckily, there was another video that lifted me right back up. It’s over a month since it was uploaded, but I just saw it for the first time yesterday. 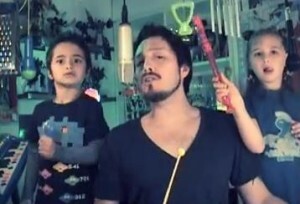 It’s a guy called Dicken Schrader and his two kids, Milah and Korben, performing Depeche Mode’s Everything Counts. It’s seriously one of the coolest things I’ve ever seen. Usually, I’m not too keen on “cute kids being cute” videos. It’s cute once, for a while. You know, in small doses. But this video just turned my whole face into one big smile and made me all warm and fuzzy inside. I’ve now watched it close to ten times in the last 24 hours, and it still has the same effect on me. Dicken is obviously a fantastic musician, and his kids are utterly charming. I won’t bother describing the video further, I’ll just urge you to go watch it right now. Special thanks to my good friend B for showing me it in the first place. Last up is another video posted only yesterday. It’s a great little short from The Animation Workshop: Space Stallions! 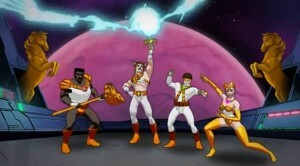 Reminiscent of 1980′s cartoons like He-Man and Voltron, this is a fabulous piece of animation that’s sure to bring forth feelings of nostalgia for anyone who grew up in the 80′s. I hope you enjoy it.